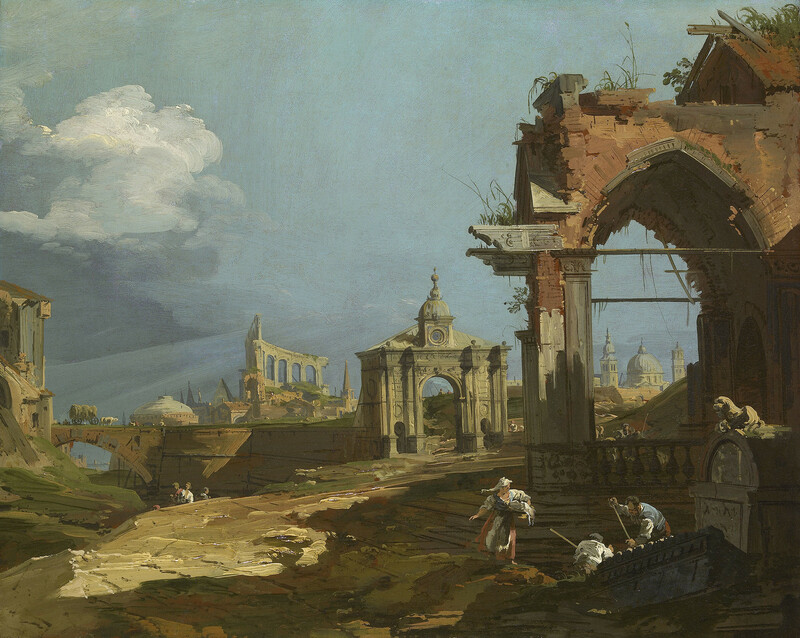 The strong colours, dramatic lighting and threatening sky give this capriccio a strikingly forceful effect. A shaft of light from the right passes through the Colosseum on the horizon, while strong shadows are cast across the foreground by a building out of view to the right. The three figures in the foreground are spotlit, the men hard at work and the woman caught mid-stride. Their animation is reminiscent of the characters in Marco Ricci’s small capricci on fine leather. The dome and campanile visible through the arch on the right resemble Santa Giustina at Padua, which Canaletto had included in his etching San Giustina in Prà della Vale of similar date, while those in the centre and left are reminiscent of his imaginary view of Padua. Just to the left of the arch is a gate, which has been compared to the Porta San Giovanni in Padua, but with its clock tower is much closer to the Porta Venezia. To the left of the ruin based on the Colosseum is a pyramid, a motif that frequently appears in Marco Ricci’s paintings, and a dome recalling that of the Pantheon or Palladio’s Villa Rotonda at Vicenza. The hay-cart crossing the bridge at the far left reappears in Canaletto’s etching of The Wagon Crossing a Bridge (RCIN 807808) – although in the etching the wagon is empty - and in both the top halves of a group of figures in a boat can be seen as they glide past the riverbank. The carved recumbent lion lying on the right reappears in other compositions by Canaletto of this period, such as the drawings A fountain on the shores of the Lagoon (RCIN 907537) and A medieval tomb amid classical ruins (RCIN 907526). Despite his fluid manipulation of paint, Canaletto used a ruler for the architectural details and incised lines in both paintings. The central arch was at first freely painted to the right and then corrected by using dividers, which were also used for the clock face above.